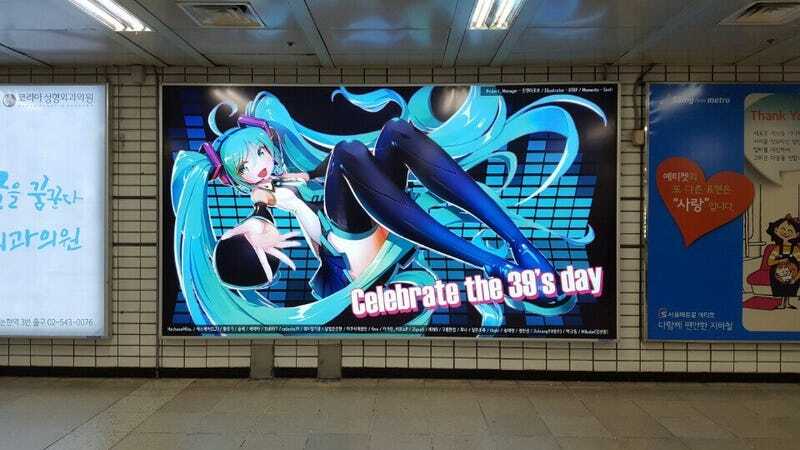 Well, ask yourself: Are you willing to pay for a billboard in a subway station to show off your Hatsune Miku love? That’s exactly what a group of South Korean fans apparently did. According to Ruliweb (via tipster Sang), Hatsune Miku fan art was turned into a billboard for March 9 to celebrate what the fans called “3/9 Day.” This is a pun, because “three-nine” sounds like “Miku” in Japanese. The fans commissioned an artist named BTRP to do the work. Around 25 fans pitched in to show their Miku love, and it cost the equivalent of approximately US$2,700 to keep the billboard up for several weeks. In case you missed it, check out Kotaku’s review of Hatsune Miku: Project Mirai DX, which Mike Fahey might love more than you do.